In the next few posts of my Azure Data Factory series I want to focus on a couple of new activities. Specifically the Lookup, If Condition, and Copy activities. 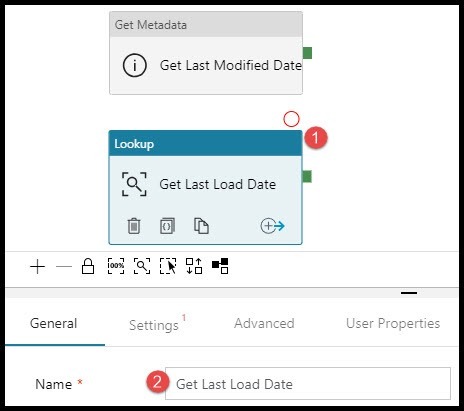 The copy activity in this pipeline will only be executed if the modified date of a file is greater than the last execution date. In other words, the copy activity only runs if new data has been loaded into the file located on Azure Blob Storage. The following diagram provides a visualization of the final design pattern. If you come from an SQL background this next step might be slightly confusing to you, as it was for me. For this demo we are using the lookup activity to execute a stored procedure instead of using the stored procedure activity. The reason we are not using the stored procedure activity is because it currently does not produce any output parameters and therefore the output of a stored procedure can not be used in the pipeline. Maybe this is something that Microsoft will add as functionality in the future, but for now the lookup activity will get the job done! 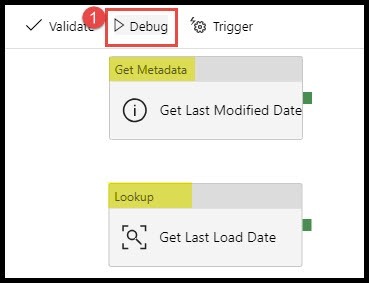 First, I am going to drag the Lookup activity into the pipeline along with the Get Metadata activity from the previous blog posts. In the properties window I changed the name of the task to “Get Last Load Date” to make it more descriptive. After the name has been assigned from the previous step, select the Settings tab. Choose a “Source Dataset”. A dataset must be selected even though we are not returning the results from the selected dataset. We are going to return results from a stored procedure. I have chosen a dataset that links to my Azure SQL DB where my control table and stored procedure current exist. Finally, click the radial button for Stored Procedure and then choose your stored procedure from the drop down list. Now that the lookup component has been configured it’s time to debug the pipeline and validate the output results of our activities. After a successful run you can validate the output parameters by clicking on the buttons highlighted in the below image, this was explained in more detail back in the first post of this blog series. In the next blog in this series I will outline how to use the output parameters from these activities using the If Condition activity. Thanks for reading my blog! Great blog! Is there an email subscription for your blog? I couldn’t find any. Keep up the great work. Thanks! Hey Syed, thanks for the great feedback. This blog needs to be updated and I will be working on making some updates in the next couple weeks and this should make it easier for users to subscribe. Thanks again! Hey Mitchell, thanks for this great post. I have a doubt here. 1.We are pulling last modified date a file which is stored in a blob using meta data activity. This is clear and now Stored procedure is returning the last Execution Date from my Control Table so are we storing our data from file into a table? Mitchell, thanks for this wonderful article. Any approach will be helpful! I receive different files everyday based on last modified date I need to trigger only that particular file to copy data to SQL. If those files are loaded into an Azure Blob Storage account then you can simply use an Event Based Trigger in ADF. This trigger would kick off your data flow anytime a new file is added to your storage account. Thanks!